This is the official discussion topic of the Frostpunk Trainer and Cheats in the WeMod app. Please post any suggestions, bug reports, or praise that you may have for the cheats in here! Hey, first off I am really happy to see a trainer up for this title, I really love and appreciate the work everybody puts in for the community. Sadly I don’t seem to be able to actually load the cheats for some reason. It opens the game like normal but i can’t use any of the cheats and the ‘play’ loading button hasn’t changed. I’ve tried turning it off and on again and all the other normal things i can think of to try to get it to work but I’m stumped. Hopefully I am the only one that’s having this problem, I may very well just be doing something wrong, but just in case I’m not you know about it now. Disable your antivirus and add infinity to its exception list. Spam the Play key. You can also try launching the game yourself then attaching infinity. I assume you have steam version. Trainer is awesome, but can you in next update add instant research too? 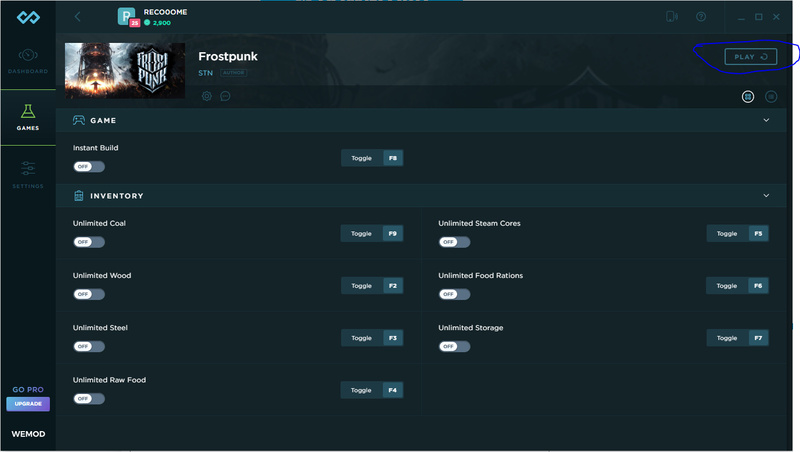 The Frostpunk cheats have been updated! Thank you for this! if its not to much to ask, could we get an instant lawbook cooldown? Hey dude me again, I’m still having the same problem. I’ve got Norton antivirus, I added the infinity folder to its exclusion list and disabled it for good measure and it still won’t work, every other game works fine. And yes it was a steam purchase by the way. When I hit play in infinity it opens the game, but the cheats don’t start, it just sits there loading, I added a pic with my first post about it. Oh right. First off. Delete Norton. It’s one of the worst AV ever made alongside Avast. Even if disabled and added exceptions it still will block stuff. I have tried that too, hasn’t fixed it. Then I am out of options. Only thing I can say is something is blocking it. Love this trainer, also a instant lawbook cooldown would be cool (pun intended). no need to worry about my problem anymore, uninstalling and reinstalling infinity fixed the problem! I can confirm this bug, it is the only option that doesn’t work for me either. Will there be a release of trainers for Frostpunk Microsoft Store version? I need to earn my Xbox achievements.